Abandoned without support, allies become enemies and enemies battlefield allies. When you are cut off behind enemy lines you need all the help you can get, even in the form of a nosy reporter blackening your name while saving your life. Behind enemy lines is a 128 page campaign sourcebook and setting that takes a new mercenary company from their inception to the very corridors of power. 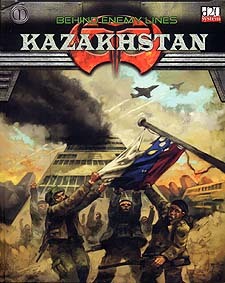 Featuring a detailed overview of Kazakhstan, the Casablanca of the Armageddon War, this sourcebook showcases all the hallmarks of a successful Armageddon 2089 RPG campaign - political corruption, moral decisions and blazing combat. Featuring full colour pictures and CGI artwork, Behind Enemy Lines: Kazakhstan is the first campaign resource for the Armageddon 2089 RPG.